Yes you better believe it but today Bob Latimer and his wife Sandy, together with Mark Holding, Terry Cunliffe and myself met at the Holiday Inn near Haydock Park to hold what I like to call a TSSH International Convention. International because Bob and his wife are from New Zealand, and are currently in the UK on an extended holiday. Over an excellent lunch so kindly provided by Bob - many thanks for that - we discussed many aspects of our shared experience and love of MSTS. Reference was also made to Open Rails and the other sim. I believe we were all agreed that MSTS, despite its many "foibles", still provides a very good train simulation experience. There was of course also a nostalgic look back to where we were back in the proverbial "good old days", as well as an acceptance that continuous Operating System upgrades continue to be challenging. I'm sure if I'm guilty of over egging the pudding comments will be made! A brief reference was made to Brexit but it was then pushed way to the back, and more enjoyable subjects were introduced such as the the heritage railways visited by Bob - personally I was quite envious, especially when he described the footplate ride on the West Somerset Railway from Bishops Lydeard to Minehead! All in all it was a very enjoyable time, whether we can reciprocate in New Zealand is somewhat debatable unless I start the National Lottery! Here's a picture of the attendees looking somewhat replete! I envy you all for having such an opportunity to meet together. You are all only text written to the ether, to me! I do not even know who is who in the photograph! dforrest wrote: I do not even know who is who in the photograph! 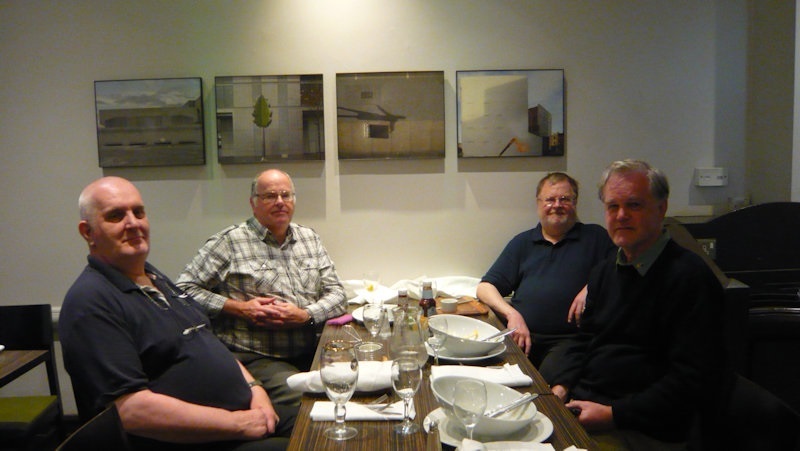 From left to right:- Mark, Alec, Terry and Bob. It is nice to be able to put a face to a name and meet in person. As Alec said it was a nice little get together, and a nice chat over lunch, thanks to Bob for the lunch, and Alec for taking me along. Looks like it was fun. It's always good to meet up with people that you have online conversations with and put a face to a name. It does add a lot of context to discussions as you then know the person behind the text. At the very least it prevents flame wars. It's just a year since Ged and I met up in Worksop and that was a lovely morning. I must meet up with Bob when he gets back. He's not too far away from me across Auckland.